I would guess that the majority of your gear decisions are based on the performance qualities of the particular item you are looking for. Function before form is a requirement when trusting your enjoyment, if not your safety, to a piece of equipment. Thanks to Jaesen at Cajun Custom Rods I have seen that the two are not mutually exclusive. 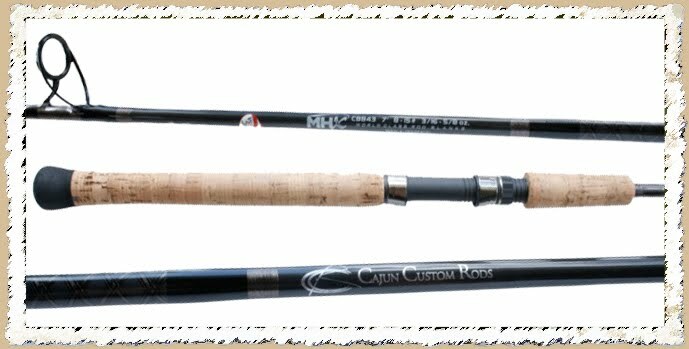 Cajun Custom Rods builds heirloom quality rods that will perform at least as well as their G.Loomis or St. Croix counterparts. Jaesen has a passion for building YOUR rod like no one I have ever met. We started by discussing where I fish and what I fish for, that was the springboard for everything to come. What came next however, was not what I expected. I was asked to play on the CCR website. At first I didn’t think much about the idea, four hours later I had designed over a dozen different rods. How did I spend 4 hours designing rods online? The answer is; the CCR website is SWEET! As a visual person, being able to see images of the components you are looking at made all the difference in the world. I got a real idea of what my rod would look like and I couldn’t stop trying to build the “perfect” rod. The end result proved to be better than I had dreamed. I got a fish slaying stick that looked like it should be in a glass case at the Louvre. The cork handle and ergonomic reel seat made holding the rod incredibly comfortable. The tread work was far beyond function, it added a level of artistry that I have never seen in custom rods. I could cast a country mile and I felt even the slightest bump by the finicky Walleyes. An amazing all around rod, and one that my son will inherit one day, but only after I catch my share of fish on it first. CCR prides themselves on their customer service and warranty. I got to find out why first hand. When I received my rod, via a popular shipping company with brown trucks, the blank was broken in half about 6 inches from the tip. I called Jaesen and he immediately had me ship the rod back to him. I was a little concerned because we were leaving for our BWCA trip in about a week. 5 days later I had a completely redone rod in my hands, this time delivered by a different company in a shipping tube you can drive a truck over. While on my BWCA trip, the rod took quit a beating, crushing one of the eyelets. Once I was home, I shipped the rod to CCR and again 5 days later I have a pristine rod back in my hands. So, if you are in the market for a new rod for yourself, or as a gift for your fish-o-holic father, look no further. Visit CajunCustomRods.com and start building the rod of your dreams. As a member of the Paddle Junkie Nation you get $25 off any rod; just enter promo code PADDLECCR at checkout.